After helping Croatia to their best ever FIFA World Cup finish in Russia in the summer of 2018, Andrej Kramaric has committed his future to Hoffenheim with a new contract until 2022. 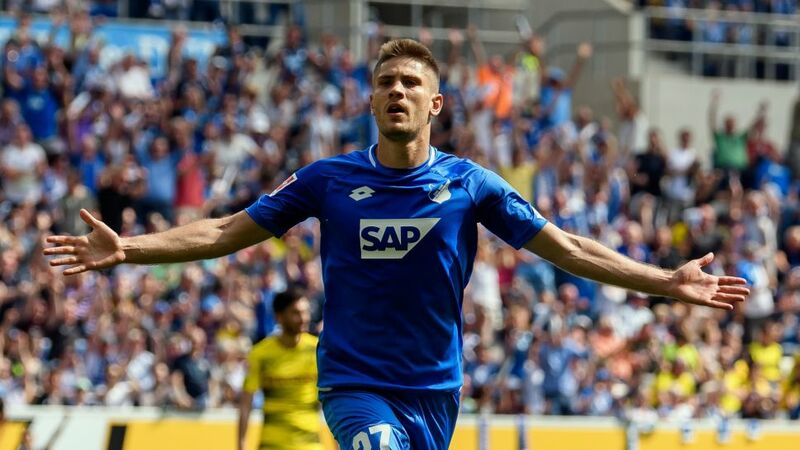 A seasoned veteran at dealing with the sudden blows of life, bundesliga.com tells Kramaric's story from the heart of the Balkans to the top of the Bundesliga. The same fire where players like Luka Modric and Mario Mandzukic were forged was responsible for igniting the footballing spark in Andrej Kramaric, who joined Dinamo Zagreb’s academy at the age of six. In 2009, he made his professional debut for Croatia’s most successful club and found regular game time as a substitute, netting seven goals in 24 appearances throughout the 2009/10 season en route to a domestic league title. The future looked bright for the young attacker with his boyhood club, yet his development was halted with the arrival of coach Vahid Halilhozic and a big influx of new centre-forward signings. Even though he faced no serious injuries, he was relegated to a minor role for the next two seasons, collecting a handful of appearances before being loaned out to Dinamo feeder club Lokomotiva Zagreb in 2012. With 20 goals in 45 appearances over the next two seasons, which helped Lokomotiva to an all-time high second place league finish, Kramaric established himself as the best young striker in the Croatian league, prompting serious doubts about Dinamo’s thought process in loaning him out in the first place. He had already achieved a similar goals-per-minutes return at the Maksimir stadium as a 19-year-old, so there’s no reason to think he would not have had a comparable impact had he stayed at Dinamo. He returned home for the 2013/14 season, only to see himself mysteriously left on the bench once again even though he had scored two goals in his first four games. He made his frustration public and promptly moved to Rijeka that same campaign. He made a noticeable impact from the get-go, aiding his new club to consecutive second place finishes and earning himself top honours in the league’s scoring charts with 21 goals in 2014/15 even though he only played in the first half of the season. This performance also earned him a debut cap for Croatia in late 2014. At age 24, Kramaric was ready to chase after a bigger challenge away from his homeland and English Premier League side Leicester City signed him in the winter of 2015. While he signed for Leicester the season before the club went on to shock the world by winning the Premier League title in 2015/16, he was not on the guest list for Jamie Vardy’s party. After scoring two goals in 13 league matches in the closing half of the 2014/15 campaign, the Croatian was mostly overlooked by newly-appointed manager Claudio Ranieri, giving him a mere two appearances from the bench before sending him out on loan to Hoffenheim for the latter part of the season. This lack of game time also meant that Kramaric was not eligible to receive a Premier League winners’ medal. Despite the frustration he must have felt after finding himself relegated to obscurity once more, his switch to the Bundesliga was a gust of fresh air beneath his wings. He immediately became a regular starter at Hoffenheim under Julian Nagelsmann, who earlier that season had taken over the club as the youngest manager in the history of the league. When Kramaric arrived in January, the club were sitting dead last in the standings, and his five goals in 15 matches proved crucial to turn the ship around and finish the season in fifteenth place. Die Kraichgauer swiftly made Kramaric’s deal permanent. The following season saw Hoffenheim reach previously unimaginable heights largely thanks to Nagelsmann’s managerial virtues and Kramaric’s 15 goals in 2016/17, more than any of his teammates. The Croatian played in every single league match and turned on the afterburners in the latter part of the season, scoring 11 times in 14 matches, including in a 1-0 victory over Bayern Munich, Hoffenheim’s first against the record champions. Although their first foray into the UEFA Champions League ended early, with eventual finalists Liverpool winning their qualification round match-up, Hoffenheim's Bundesliga campaign could not have started any better. They remained undefeated until MD7, defeating Bayern once again - this time 2-0 -in the process. The Sinnsheim Orchestra looked to be in tune until the music abruptly stopped. The team hit a slump in form that saw them fall all the way to ninth by January. Between the third and twenty-first games of the season - more than six months apart - Kramaric was unable to find the back of the net. That fact was not missed by the German press and led to many questions regarding his role in the squad, including from his own coach, who still played the Croatian in every game that season but made him start from the bench when the dry spell seemed most evident. Once Kramaric got his scoring mojo back against Hertha Berlin on Matchday 21, he went on a hot streak with six goals in five games. This coincided with an overall improvement in the squad, with Serge Gnabry and Mark Uth also playing a big role to pip Borussia Dortmund for third place on the last day of the season after a convincing 3-1 victory. Kramaric the charm to go all the way? Prior to Russia, Croatia had only won three World Cup matches since legendary striker Davor Suker made them the belles of the ball in France '98. After disappointing in Korea-Japan 2002, a winless Germany 2006, not qualifying for South Africa 2010 and getting convincingly eliminated by Mexico oin the last match of the group stage in Brazil 2014, the Vatreni squad was looking to capitalise on a new golden generation led by Modric, Rakitic, Ivan Perisic, former Bayern forward Mario Mandzukic and, of course, Kramaric. A 2-0 win in their Russian premiere against Nigeria followed by a memorable 3-0 success against Lionel Messi and Argentina secured qualification within two games. A comfortable win against bogey team Iceland despite hefty rotations meant topping the group with nine points, sealing Croatia's best World Cup performance to date since the French fairytale of 1998. Followed by dramatic penalty shoot-out wins over both Denmark and hosts Russia and an extra-time victory over England in the semi-finals, the fairytale was eventually brought to an end in Croatia's first ever final, a defeat to winners France. But a once in a lifetime summer now means Kramaric will want to create the same memories with his club. "This decision is also an expression of my well-being," Kramaric said after extending his deal with Hoffenheim. "This club has taken an almost breathtaking development over the last two-and-a-half years that I've been here. It's a great match and I feel very well. I'm highly valued from all sides, and I'd like to continue to work with it - to drive this development forward."